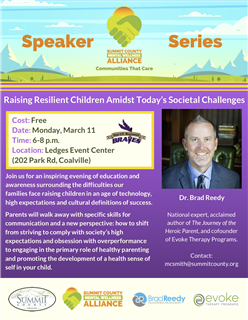 Join us on Monday, March 11th as we listen to Dr. Brad Reedy share ways we can work to raise resilient children amidst todays societal challenges. Dr. Reedy is the author of The Journey of the Heroic Parent and will provide specific skills to shift our perspectives to build a healthy self in children. The event will take place at the Ledges Event Center and is free to attend.